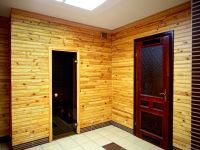 Luxury Cauna Sakura Lviv, Finnish sauna, infrared sauna, Jacuzzi next generation. Telephone (032) 234-28-12. 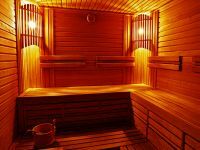 We offer a relaxing stay in a Finnish sauna, which is famous for a very hot steam. The Finnish sauna has a relaxation effect, it removes both the physical and mental stress, relaxes and soothes, very conducive to improvement of the body as a whole, helps to ease the pain in the muscles by increasing the body temperature and, therefore, accelerate blood circulation. Cost of services 200 UAH. / Hour. up to 6 people. With more people - an additional 25 hryvnia for each person for 1 hour. Every day from 8:00 to 15:00 service cost 120 Rs. / Hr. When you order the sauna for 3 hours - get an extra 4th hour in the sauna for free. (The choice of the customer instead of an extra hour in the sauna can be ordered with three in the sauna for an hour Jacuzzi). The infrared sauna works on a simple principle - direct heating of body heat from special infrared emitters. Infrared sauna high performance in the fight against fatigue, improves immunity, prevents colds and other diseases. Cost: 130 UAH. / Hour. ** When ordering only infrared saunas, cost 170 UAH. / Hr. Spacious comfortable Jacuzzi with hydro massage for maximum relaxation of the body through a deep and intense effects of warm water. Price - 150 UAH. / Hour. *. Minimum order - 2 hours. When ordering, sauna and hot tub at the same time - the cost 120gr./hour. After the adoption of the Finnish sauna or infrared, you can continue to rest on comfortable sofas lounges, watching movies on the 40-inch LCD panel, or from the heart to have fun with friends at karaoke with a huge selection..
* - In case orders Finnish \ infrared saunas. ** - In case orders Finnish sauna.